Background: Although the efficacy of bevacizumab has been established in patients with metastatic colorectal cancer (mCRC), population-based studies are needed to gain insight into the actual implementation of bevacizumab in daily practice. Since these studies are lacking for patients with metachronous metastases, the aim of this study is to evaluate the current role of bevacizumab in the treatment of metachronous metastases of CRC. 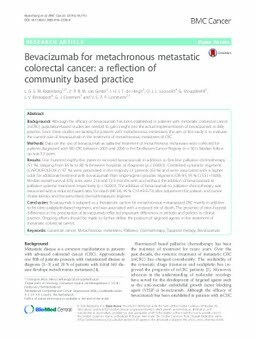 Methods: Data on the use of bevacizumab as palliative treatment of metachronous metastases were collected for patients diagnosed with M0 CRC between 2003 and 2008 in the Eindhoven Cancer Registry (n = 361). Median follow up was 5.3years. Results: One hundred eighty-five patients received bevacizumab in addition to first-line palliative chemotherapy (51%), ranging from 36% to 80% between hospitals of diagnosis (p < 0.0001). Combined cytostatic regimens (CAPOX/FOLFOX in 97%) were prescribed in the majority of patients (63%) and were associated with a higher odds for additional treatment with bevacizumab than single-agent cytostatic regimens (OR 9.9, 95% CI 5.51-18.00). Median overall survival (OS) rates were 21.6 and 13.9months with and without the addition of bevacizumab to palliative systemic treatment respectively (p < 0.0001). The addition of bevacizumab to palliative chemotherapy was associated with a reduced hazard ratio for death (HR 0.6, 95% CI 0.45-0.73) after adjustment for patient- and tumor characteristics and the prescribed chemotherapeutic regimen. Conclusion: Bevacizumab is adopted as a therapeutic option for metachronous metastasized CRC mainly in addition to first-line oxaliplatin-based regimens, and was associated with a reduced risk of death. The presence of inter-hospital differences in the prescription of bevacizumab reflected important differences in attitude and policies in clinical practice. Ongoing efforts should be made to further define the position of targeted agents in the treatment of metastatic colorectal cancer.